Check back often for an interview with a Gananoque Lions Club Member. See why they joined Lions and find out that they are people just like you that, want to help others in need and to work together making our community a better place. When did you join Lions and who sponsored you into the Club? 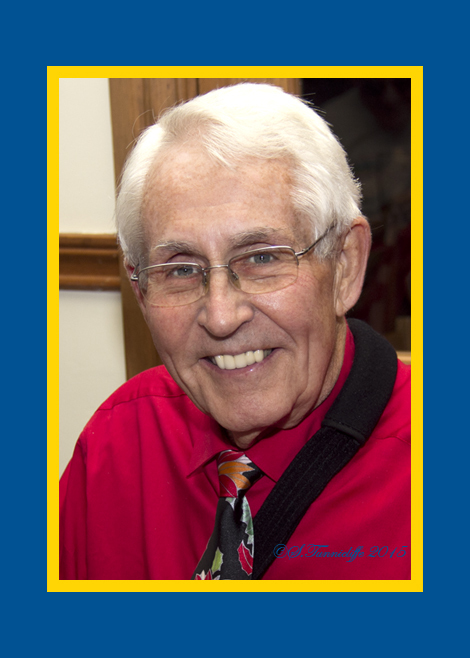 I joined the Gananoque Lions Club on June 1st 1966 and was sponsored by Lion John Mabee. Why did you become a Lion? Early in my life I began thinking about entering the health profession in some way when I “grew up”. My parents owned a small corner grocery store in the West Ward of Gananoque so as a child I had easy access to the candy case. This “sweet tooth craze” resulted in me spending many hours in the dental office having decayed teeth repaired or extracted. Gananoque had 3 generations of the Mabee family in the dental profession over the years and I came to know both John and his father, Carleton, very well. I was also very active in sports throughout my high school years and lost a few teeth on the football field. During my visits with John and Carleton they were always encouraging me to give Dentistry some consideration as a lifetime career and that I did. When I finally made that choice to become a Lion, they couldn’t have been happier or more supportive. Have you been the recipient of any Awards? What were they? Awards received can be broken down into Lions and Personal (Academic/Athletic) etc. Lions: LCF Lifetime Member presented by 1000 Islands and District Lions Club of which I was their Guiding Lion throughout their 1st year of existence. The Helen Keller Foundation Award was presented by my Gananoque Lions Club. There were also Awards of Appreciation from the District Governors when I served as Zone Chairman and Deputy District Governor during their term. Personal: At Gananoque High School I earned my school letter and both wings to complete the set. What was your favourite project over the years?. With my favorite projects over the years I will include from Lions activities those listed in #3 plus the Lions Fairs, the Big Bash, our annual Cruise In, Ribfest and PumpGanFest. They are or were fun so it is difficult to pick one over the other. Not only do we have fun but we bring joy to the community with our efforts. As far as my personal life, I will say that my favorite project has to be our ’47 Buick Super Sedanet. The car has always been owned by my family so that in itself makes it special. It was driven until 1959 and then for the next 30 years was stored in a galvanized steel garage and only taken out once a year to drive it around the block, change the oil and check the antifreeze. In 1989-90 we decided to bring it back to life with some TLC and start to show it off. In 1991 we joined the A4C (Antique Car Club of Canada), the AACA (Antique Automobile Club of America) and BCA (Buick Club of America). In numerous car shows over the years we have won awards but the most noteworthy are those earned at National and Grand National Meets. They say that patience is a virtue and that is so true when you are competing at that level. Eventually we were “rewarded” for all of our efforts. The Buick cannot win anything higher than what it has already achieved; namely, AACA Grand National Senior, an AACA National Special Award and BCA National Gold Senior. My mother was so proud of her car and we were fortunate enough to win the AACA GN Junior 1st trophy in 2010, the year she died. That year she had the opportunity to hold the trophy and have her picture taken with her car outside Carveth where she resided for the last 6 years of her life. What makes a good Lion in your eyes? To me a good Lion is one that makes every effort to live up to the oath that he or she swore when joining Lionism. There are very few that are able to attend every meeting or help with every function but all that we ask is that you do something. Do not just be a “knife and forker”. My favorite hobbies are the ’47 Buick (naturally), skiing, scuba diving and anything sports related. I’m not an avid reader other than my dental journals, auto magazines, etc. Did being a Lion make any differences in your life over the years? It only helped to re-enforce my belief in caring for and helping the less fortunate. I guess that is one reason I became a dentist and also why I became a Lion. We Serve. I feel strongly that the biggest reward in life is not monetary gain but the satisfaction that one gets from doing good to help others. When we leave this life we will take nothing with us but we will be remembered by what with did while we were here. I SERVE through Lions but Flora and I also SERVE as volunteers at Carveth Care Centre. They always welcome volunteers to their ranks. Tell me something about yourself that you don’t think people would know about you? Is there a story your family talks about? Those that have not known me all of my life might find it hard to believe that I was a very cuddly lad who weighed in at 240 pounds through most of my teenage years. That definitely put me in good stead on the football field. Even with that weight I excelled in all sports that I entered and there were many. When I turned 21 I lost 40 pounds all by natural means and over the last 15 years or so I have lost another 30. I am gradually fading away wouldn’t you say? At this point in time you do not want to know the stories that my family is talking about. What is your favourite memory so far in your life? My favourite memory(s) in my life are marrying my high school sweetheart (Pat Copeland), graduating from University of Toronto, starting my dental practice and the birth of our son and daughter. Those were the years and the best of times!!! Unfortunately I lost Pat in 1972 to acute myelogenous leukemia. Flora has rekindled my love of life. I hear that you have become "The Bionic Man in the Lions Club". Tell me about that. I am sure by the graphic reports that Flora sends out that most members already know that, thanks to modern medicine, I am slowly but surely becoming the Bionic Man but definitely not the Million Dollar Man. In 2009 I had my right hip totally replaced. In 2011 my left hip was totally replaced. This past November I had a total reverse right shoulder replacement and rotator cuff rebuild. All surgeries were a success. After the hip surgeries I was back downhill skiing but the weather and the recent surgery have nixed this season’s skiing. I’m already looking forward to next winter. Once one reaches a certain age there are some resorts where us old farts can ski FREE so that is a good reason to get up and get moving. You only live once so do all that you can. “For 50 years I have been proud to be a Lion and to live up to our motto of We Serve. I look forward to many more years in the Gananoque Lions Club”. Lion John Hampton recently received his "50 Year Pin" for his dedication and years of service to our Community. He also served as our Club President in 1972 and 2011.